"What do you have to say about the reports of these protesters being executed?" I don't approve of any form of capital punishment and wish that nobody were condemned and put to death, anywhere. "Both [opposition] leaders [Mir Hossein Mousavi and Mehdi Karoubi] noted that the executed men 'were arrested months before the June 12 election and their cases had nothing to do with post-election events.'" That's coming directly from the leaders of the anti-Ahmadinejad movement! 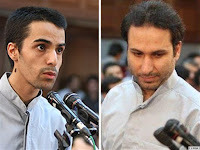 Apparently, the two condemned and executed men were found guilty of numerous things - a verdict I disagree with because I don't think the accusations warrant a death penalty, or that any charges do - including moharebeh, which means "taking up arms against Iran's Islamic system," inciting violence and insurrection, and being members of an organization called Anjoman-e Padeshahi-e Iran (also known as Soldiers of the Kingdom Assembly of Iran, Iran Monarchy Committee, Iran Royal Association, or Tondar), which is an anti-government terrorist group based mainly in Los Angeles that advocates for the forceful overthrow of the Islamic Republic and the restoration of Iranian monarchy, namely the deposed Pahlavi dynasty. Tondar has committed a number of violent acts in Iran, including the 2008 explosion of a mosque in Shiraz where 12 people were killed and over 200 injured, and has been accused of carrying out the recent (January 2010) assassination (via remote controlled motorcycle bomb) of Dr. Massoud Ali-Mohammadi, a particle physics professor at Tehran University, although the group itself denies any responsibility. The claims that Ali-Zamani and Rahmanipour were detained and convicted for their involvement in post-election actions is bogus since both men were arrested well before the June 2009 election for their connection to the 2008 mosque bombing and were both in prison during the election and subsequent fallout. In an article, disingenuously titled "Iran 'executes' two over post-election unrest," the BBC even quotes Rahmanipour's lawyer, Nasrin Sotoudeh, saying as much: "He was arrested in Farvardin [the Iranian month covering March-April] - before the election - and charged with co-operation with the Kingdom Assembly." Nevertheless, the White House felt the need to condemn the execution of the two men tried and convicted of sedition. "We see it as a low point in the Islamic Republic's unjust and ruthless crackdown of peaceful dissent," Bill Burton, deputy press secretary for the White House, told reporters. "Murdering political prisoners who are exercising their universal rights will not bring the respect and legitimacy the Islamic Republic seeks," he continued. "It will only serve to further isolate Iran's government in the world and from its people." Apparently, according to Obama's administration, it is every Iranian's sovereign right - or perhaps, duty - to work with separatist groups, funded by the United States, to commit violent acts against the Islamic Republic. This is now classified as "peaceful dissent." While the death penalty is bad, demonizing, misinformed and deliberate anti-Iranian propaganda spread rapidly and rabidly by the Western press may be far, far worse. I have recently learned of new case, involving a 20-year-old university student Mohammad Amin Valian, whose death sentence has been upheld. According to reports, "Valian was arrested for throwing stones during the December 27 Ashura demonstrations, a crime to which he confessed...It appears this would be the first person facing execution after the election." If this is all true (I have not researched the case myself), this would be very upsetting indeed. Throwing stones and receiving the death penalty? That's clearly excessive. I would certainly hope that Iran, which has signed onto the Rome Statute, would ratify it. I would ask the same of the United States, which has not only not ratified the Statute, but was also one of seven countries to vote against treaty in 1998, along with Iraq, Israel, Libya, China, Qatar, and Yemen. my short, long, quick response: "israel and usa execute protesters every day as sport or to give them freedom, liberty, and democracy." those who are traitors (working for, assisting the enemy) should be executed. in america and israel they are. even if not, some go to prison for long terms, eg, john walker lindh. "even if not, some go to prison for long terms, eg, john walker lindh." probably confusing. i dont consider jwl to be a traitor but someone unjustly, criminally used by the last regime. My question is where does the US kill these protesters you speak of? Inside the US or outside? Please give your source for this claim? Not to say it couldn't go on in secret and a person winds up "suicide". The guy who broke the Iran-Contra story told a friend if I wind up dead don't believe it.